Design for the City. Public space is where we all congregate and pass through every day. I'm fascinated with design's role in mediating the human experience in urban centers. 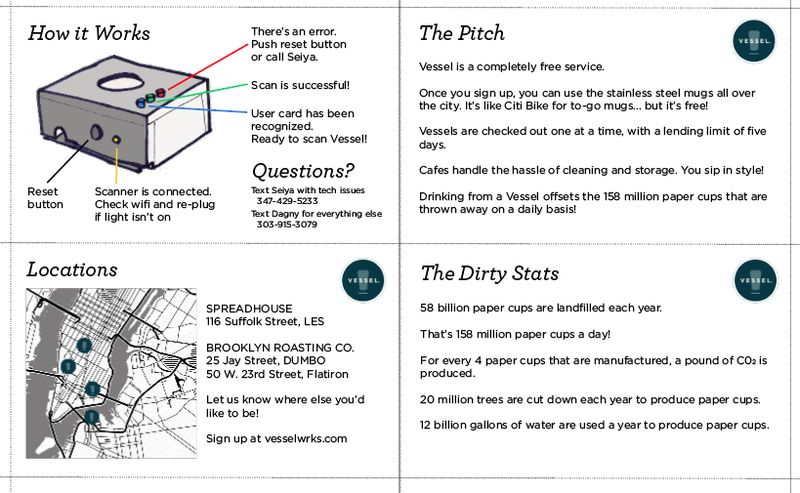 Vessel Wrks is a social impact venture that's aiming to provide a convenient alternative to the 1.58 billion paper cups Americans send to landfill every year. It's a free service of reusable stainless steel mugs that can be checked in and out of cafes across New York City. It's like Citi Bike for mugs, but it's free! Cafes pay a minimal fee for every use of the mug (half of what they pay for their paper cups) and they take on the role of cleaning and storing the mugs. Customers pay nothing to opt into the sustainable choice to their daily cup of coffee. I've taken on a myriad of roles in this start-up. Primarily, I am the lead experience designer responsible for understanding how our users and stakeholders interact with the product and service. I've conducted in-store interviews, observations, and interactive public surveys to determine what aspects of our pilots we should change and what we should capitalize. Secondarily, I now manage our social media channels (Facebook, Instagram, Twitter, and YouTube) and strategize its content. 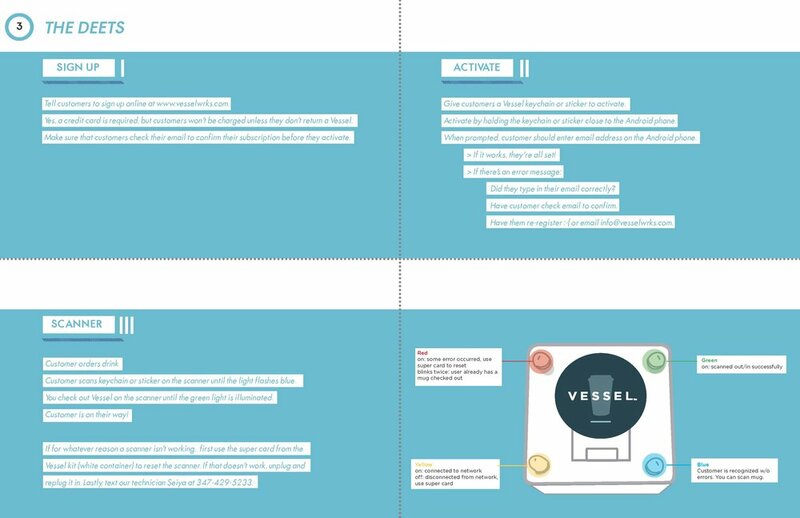 Finally, I've designed and produced in-store collateral for customers and baristas, prototyped our in-store sign-up kiosks, and contributed to our Indiegogo campaign. Designed in Winter 2015 at Parsons School of Design with Jack Wilkinson, Stephanie Lukito, Andy Morales, Elena Habre and Gui Curi. The era of smart cities is here. From payments to steps to refrigerator inventory, we capture all kinds of data, but we don't capture the data of how we feel. Our cities need an emotional infrastructure in the same way that we have roads, telephone lines and plumbing. Our project AndYou is a freestanding post that’s installed in public places that give you pause, such as a park or street corner. When a passerby stops and rests their hands on either side of the post, it does three things. First, the post changes color to the mood of the participant. Second, the post plays an anonymous message from someone else. Finally, the participant is asked to share her own message of how she’s feeling. These messages and hand-sensors are data points that serve as self-reflection tools for its users, but also serve as an aggregate of the collective mood of a city. The project was a cross-continental collaboration with Toshiba, Chiba University, Parsons School of Design and Glasgow School of Art. The Japanese government sponsored this Global Products of Design fellowship as a way to cultivate design collaboration and knowledge share across countries, disciplines and industries. Designed in Fall 2015 at Parsons School of Design with Darcy Bender, Sam Haddix and Christopher Lopez. In partnership with Rockaway Waterfront Alliance. The Rockaways is a primarily residential peninsula in Queens, New York. Despite being a popular summertime destination because of its beaches, the dominant narrative is one of being forgotten and ignored by the city of New York. Through on-the-ground research and interviews with residents in a particularly underserved area of the Rockaways, we narrowed our project focus on civic engagement. We honed in on the role of community boards because they act as the main connective tissue between citizens and government in the Rockaways. The issues associated with Community Boards are well known. Time-consuming, rigid, hierarchical and poorly funded – these civic swamps employ linear decision making, taking yes/no votes that reduce complexity and managing rather than ideating. Our project OpenForum reimagines what a more effective model of civic engagement could look like. It shifts the idea of people as consumers of decision-making toward a model in which they become active participants in the decision-making process. Our project sets out to reorganize the ways that the desire and the capability for participation is produced.